Usually when we think about bringing down the stress levels, we may think about a massage, a yoga class... But for some reason, eating things to reduce stress is rarely at top of mind. Even more rare, is our consideration of the amazing therapeutic and calming benefits of mushrooms. 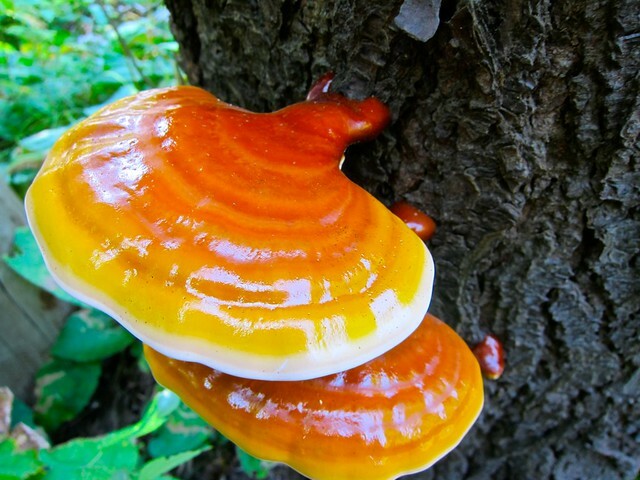 Ever heard of reishi? This, my love sweet lovers is the secret ingredient- the key to long term total mind and body zen. Seriously. 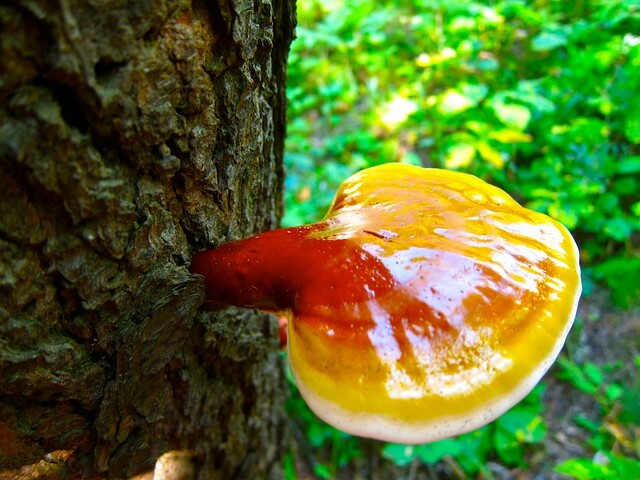 Reishi musroom is a bit of magic- not to be confused with magic mushrooms. In the summer, the best nutritionist ever, our Superhero Josh Gitalis, and I, were on the hunt for this elusive mushroom. We searched high and low, walking trails and off trails traipsing through the woods up north at my cottage. And then, as we were essentially resigning ourselves to the fact that we would have to wait another year before we discovered this gem, the man stops in his tracks. We were walking along the main road, heading back from our final forest foray, when right there, beside the road, next to an electrical pole, was a tree glowing with these glowing red beacons of forest medicine. Now, whether you appreciate foraging or not, and the thrill you get from discovering treasures in the wild, you have to admit, these specimens are pretty beautiful. They literally look like flying saucers glowing off an old tree. 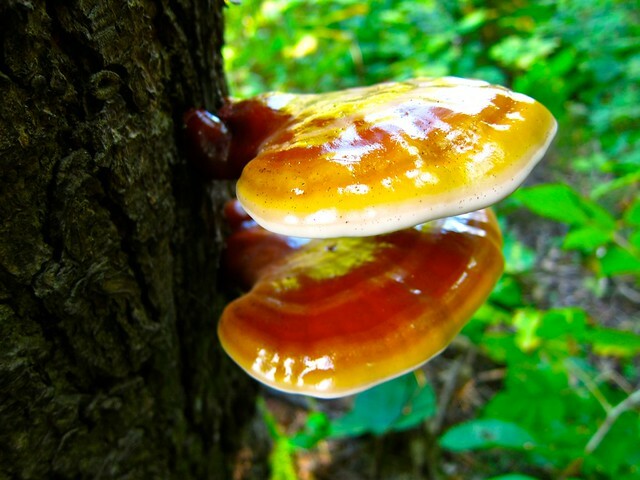 Reishi mushrooms have adaptogenic properties. It helps your body adapt to stress. This means that if you feel dragged down and sleepy mcsleepersville all the time, like you lost your oomph, it helps pick you up. But by the same measure, if you are experiencing stress and feeling wired, like you can't stop the spinny brain, it can also help you chill right on out- making it awesome as a natural, long term, nervous system supporting strategy for anxiety and depression. When taken regularly, it can restore the body to its natural state, enabling all organs to function normally. Immune modulator - which means if you have an under-active immune system, it powers it up, if you have an overactive, in the case of auto-immune it regulates and fine tunes it to the right balance. This immune-regulating action also works wonders in the prevention and treatment of cancer- prostate, breast, lymphoma and totes anti-tumor to name a few cancer kicking properties. Due to its high content of heart-saving substances like sterols, ganoderic acids, coumarin, mannitol and polysaccharides, it is amazing for protecting the heart. Traditionally used by chinese women to beautify the skin. Included in many Japanese patents for hair loss formulas, including products used for alopecia. I don't expect you to run out to your nearest Northern woods and start looking. You can get it as an extract from your local herbal or health food store or take it as a liquid tincture or as a powder in capsule form. One of my most fave ways to take it is in a blended herbal formula like the Peaceful Spirit, (that will be used in tomorrow's latte). And often, I'll add a few into my smoothies too! What I really want to offer you today, as we head into what is commonly known as cold and flu season, are some amazing essentials you need to have in your arsenal to keep the stress down and the immune system strong. Stress is the second worst thing in the whole wide for immune health (second only to sugar! )- it impairs our ability to sleep, to exercise well, to make the right food choices and that creates this icky cycle. Remember my Five Easy Steps To Catch The Flu? Lectin-Free Diet: Will This Improve My Health?